BJ Rutledge | Loving God. Loving People. Loving Life. Jesus said by our fruit people will know us. If you’re a Christ follower, the fruit of your lips, the fruit of your attitudes, the fruit of your actions & reactions, the fruit of your social media posts all paint a picture to the world of what Christians are like. Sour posts, lips, attitudes, actions and reactions don’t help the cause of Christ. A thought from my time in Matthew 7 this morning. Just saying! 15 years ago this morning I woke up to spend my first morning in Wise County as the Lead Pastor of Grace Fellowship. I was so excited about being a part of this new church! I believed and asked God to do something here that had never been done in a rural setting. I’m still believing & asking Him for this. I had no idea of the incredible journey God would take us on. My prayer was similar. Lord, I feel like a little child who doesn’t know how to lead this new work. I’m in desperate need of You. Please give me wisdom and discernment to lead well and to discern between good and evil. 15 years later I’m still reminded that I am like a little child and am totally dependent upon God. As I shared on Sunday, January 20th, there are times I’ve gotten ahead of God; making decisions based on my own thoughts and trying to do things in my own power. Anytime, I’ve done this – I’ve messed things up! I’m still on the journey and still learning how to submit to God and depend on Him. In light of this, if you pray for me, please pray that I’ll have God’s wisdom and discernment and depend on His direction and power in all things. 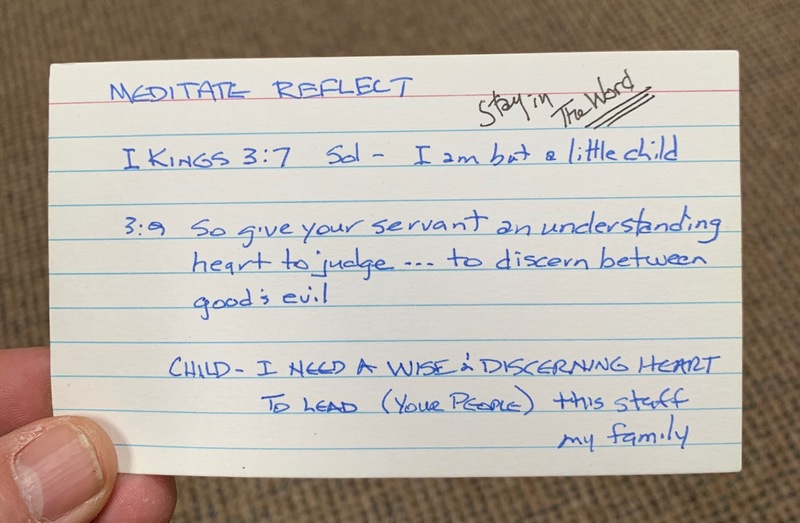 The photo above is of one of the “prayer cards” that I use in my time alone with God. 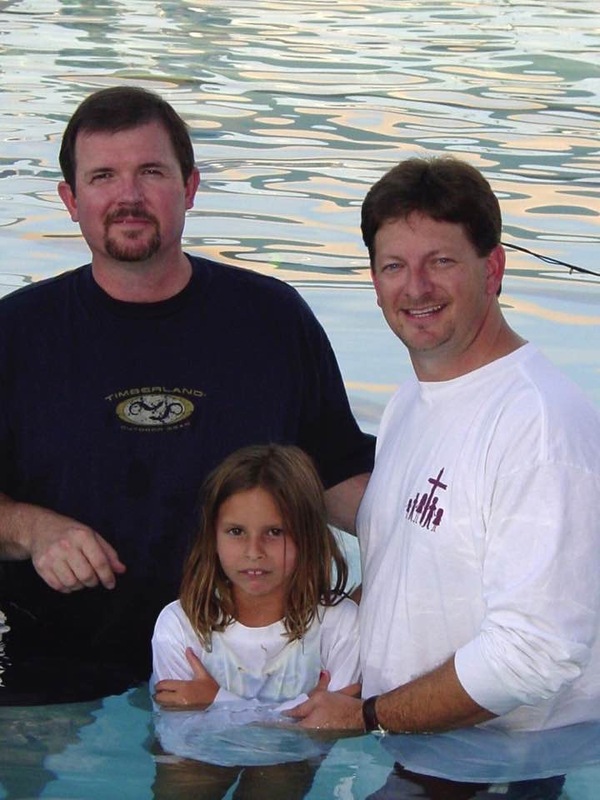 On January 26, 2004, I spent my first night in Bridgeport as the new lead pastor of Grace Fellowship. As I reflected on the 6 month journey of faith that brought us here from The Woodlands I sat in the recliner in our the apartment we’d moved into that day and wrote a few words. 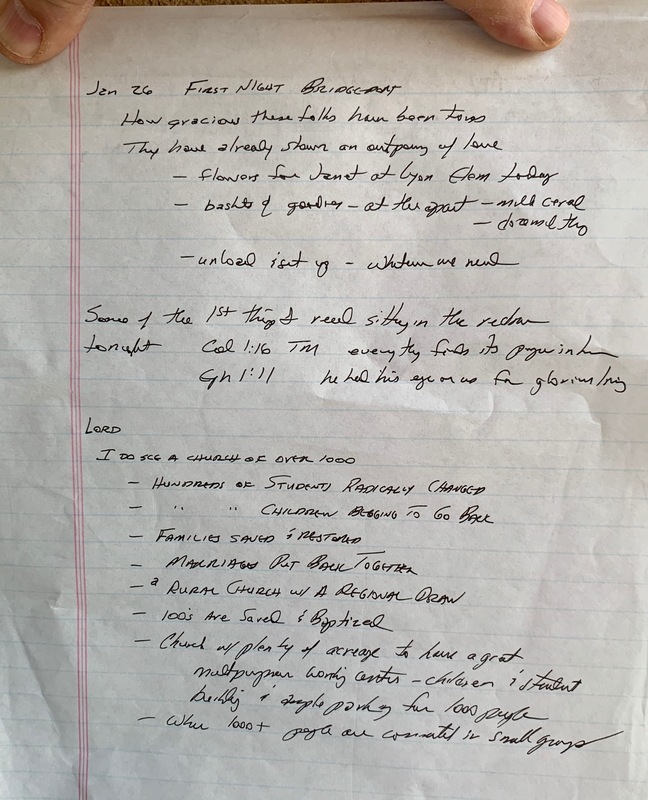 A photo of that journal sheet is attached. Since it’s difficult to read my writing, here’s a transcript of the journal page. Lord, I do see a church of over 1000 – hundreds of students radically changed – hundreds of children begging to go back – families saved & restored – marriages put back together – a rural church w/ a regional draw – 100’s are saved & baptized – church with plenty of acreage to have a great multipurpose worship center – children & student building & ample parking for 1000 people – where 1000+ people are connected in small groups. I took the 95Network Board to Sweetie Pies last night after our One Day Leadership Conference. We had a great meal and met Jennifer who served us at our table. She introduced herself as the 2nd best waitress (server) in Wise County; there’s a great story behind this, but you’ll have to ask her to share it with you! Her joy about what Jesus has done in her life was infectious! 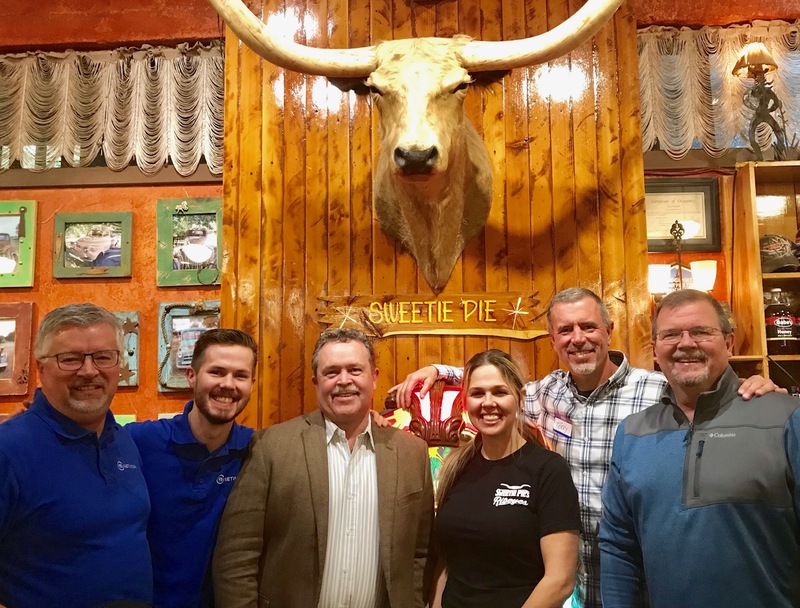 Her story about how Christ has transformed her life is amazing, and she brought joy, hope and laughter to 5 pastors who had the pleasure of meeting her at Sweetie Pies. We were blessed and encouraged at the way her testimony about Christ flowed so naturally in her conversation with us. This led to a number of questions and hearing a portion of her story about the life-changing love and grace of God in her life. We ended up having dessert (not my best choice), but the icing on the cake for all of us was Jennifer’s infectious love for Jesus! Want to know how to live and love as Jesus did? He gives us a concise description of foundational truths and principles in Matthew 5, shared here in the Amplified version. 3 “Blessed [spiritually prosperous, happy, to be admired] are the poor in spirit [those devoid of spiritual arrogance, those who regard themselves as insignificant], for theirs is the kingdom of heaven [both now and forever]. 4 “Blessed [forgiven, refreshed by God’s grace] are those who mourn [over their sins and repent], for they will be comforted [when the burden of sin is lifted]. 5 “Blessed [inwardly peaceful, spiritually secure, worthy of respect] are the gentle [the kind-hearted, the sweet-spirited, the self-controlled], for they will inherit the earth. 6 “Blessed [joyful, nourished by God’s goodness] are those who hunger and thirst for righteousness [those who actively seek right standing with God], for they will be [completely] satisfied. 7 “Blessed [content, sheltered by God’s promises] are the merciful, for they will receive mercy. 8 “Blessed [anticipating God’s presence, spiritually mature] are the pure in heart [those with integrity, moral courage, and godly character], for they will see God. 9 “Blessed [spiritually calm with life-joy in God’s favor] are the makers and maintainers of peace, for they will [express His character and] be called the sons of God. 10 “Blessed [comforted by inner peace and God’s love] are those who are persecuted for doing that which is morally right, for theirs is the kingdom of heaven [both now and forever]. 11 “Blessed [morally courageous and spiritually alive with life-joy in God’s goodness] are you when people insult you and persecute you, and falsely say all kinds of evil things against you because of [your association with] Me. 12 Be glad and exceedingly joyful, for your reward in heaven is great [absolutely inexhaustible]; for in this same way they persecuted the prophets who were before you. I believe Alabama has built one of the premier football dynasties of all time, but I have to admit I was pulling for Clemson in the National Championship Game Monday night. If for no other reason, I was pulling for them because of what I’ve heard from and seen in Dabo Swinney over the past few years. Following Clemson’s incredible win in the National Championship on Monday night, I found an number of leadership lessons in the unrehearsed words that flowed from Coach Swinney in his post-game comments. This is not a direct quote, but he said when you get a group of young people together who believe – who love each other – who sacrifice and are committed to a singular purpose – great things can happen and that’s what you saw tonight. That’s an amazing axiom for any team; especially those of us who serve on a church team. When a group of people (young & old) will come together and believe in the mission/vision of the church and each other – when they’ll love each other in spite of mistakes – when they’ll sacrifice for the mission and one another – and are committed to a singular purpose (the purpose of Christ) – great things can (and will) happen. Players and coaches are going to miss assignments and calls; mistakes will take place. However, when we can love as Christ did and face those mistakes with grace, encouragement and accountability and keep our focus on our purpose, amazing things take place. When I know my teammates love me and will sacrifice for me and for the mission, great things take place. When we are committed to the singular purpose of Christ and His kingdom and not our own individual kingdoms, great things take place. If you’re part of a team – or want to be – evaluate your attitude based on these axioms. Be a part of developing this kind of attitude in your own heart and team, and great things will take place. I hope and pray you have a Merry Christmas and Happy New Year! LIGHT, our Christmas services at Grace, were an awesome time of celebrating the purpose of Christmas. If you missed it and want to watch, go to gf.church/watch. 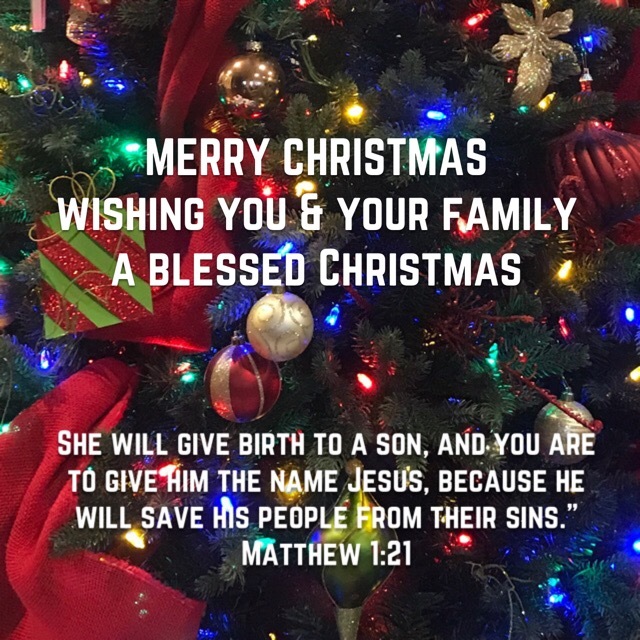 As you think about Christmas on this Christmas Eve here are a few verses that might be good to share with your family, or for you to reflect upon. Approximately 700 years before Jesus was born, God chose the Prophet Isaiah to write the words of this prophecy. Jesus who is all these things and more, was born with a purpose. The traditional Christmas story is found in Luke 2. John who was an eyewitness of the life & death, the burial and resurrection of Jesus wrote several of the documents preserved for us in the New Testament. Saul who hated the name of Jesus and violently persecuted Christians became a Christian when he had a personal encounter with Jesus after Jesus was raised from the dead. Saul became a new person with a new name, Paul, and wrote much of the New Testament including the letter to the Romans. Sin brought about physical and spiritual death, but spiritual death is the result of rejecting the gift of life through Jesus Christ. I believe Romans 6:23 is speaking about the 2nd death (spiritual death) for those who refuse to put their faith and trust in Jesus Christ as Savior and Lord. The 2nd death is referenced in several places in Revelation – chapters 2, 20 and 21. Merry Christmas – I hope you experience Jesus the LIGHT of the World this Christmas. During our 21 Days of Prayer, 1 Timothy 2, was included as a passage to read. Check it out again. Please continue to pray for people to embrace the truth of the Gospel of Jesus Christ and to surrender their lives to Him by believing in Him and receiving Him as Lord and Savior. He’s the only way to God. Please pray for me as I make final preparations to speak about the LIGHT of the world Jesus Christ tonight and tomorrow. Pray that I’ll be able to fearlessly make known the truth of the gospel of Christ. Pray for people who attend LIGHT to respond and trust Christ as Lord and Savior. Thank you for praying for LIGHT over the past 21 days. I hope you’ll make it your habit to pray for people in our communities who don’t know Jesus (the Light of the World), for Grace & other churches in our communities & for me & our staff as we strive to lead people into a growing relationship with Jesus Christ.